Explore the many woodworking projects and plans, available on myCarpentry.com, and learn basic carpentry skills as you build. Try out the free online carpentry tools, like the stair calculator, roof pitch calculator, and the span tables for joists and rafters. If you are interested in building a deck, visit Build a Deck and walk through the 10'x10' deck tutorial. 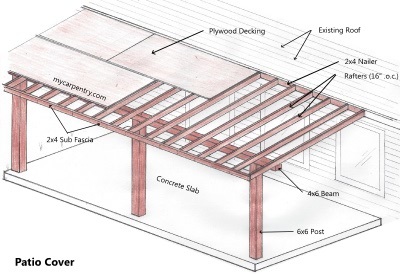 This tutorial covers framing, footings, decking, build deck stairs, railing, and stair railing. These simple workbench plans make good use of standard sized lumber to reduce excess waste. 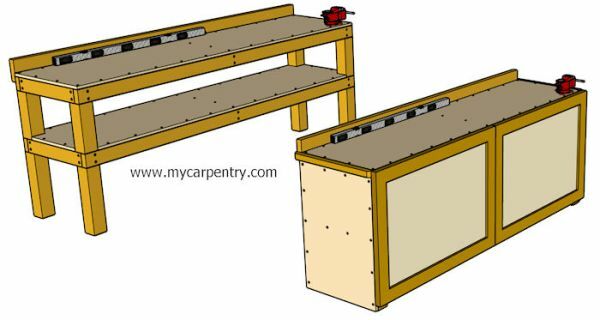 This workbench design also includes plans for optional side panels and doors. 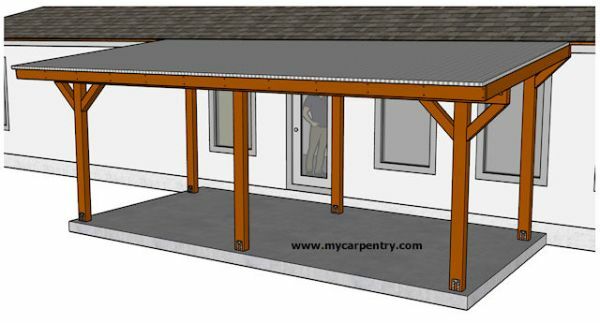 These almost-free-standing patio cover plans might be just what you are looking for if your existing roof is not capable of supporting the weight of a patio cover roof. It is not too early to get started on those Springtime woodworking projects! 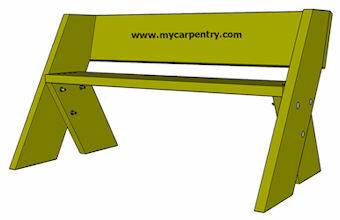 Build your own picnic table or other outdoor furniture items using the completely free plans on mycarpentry.com. Easy Bench Plans - Building a bench is an easy woodworking project that will provide years of value. 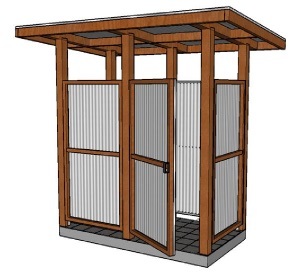 Outdoor Shower Plans - I designed and built this outdoor shower on some property located in the Hill Country of central Texas. The corrugated tin and western red cedar structure blended well with the local architecture. Make your own ladder racks and save big bucks! 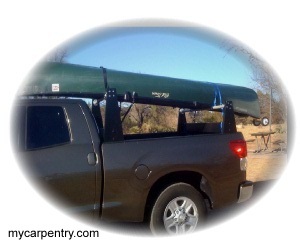 When I was looking for racks to haul my canoe, I was surprised at how pricy the name brand racks were. I decided to do some research on materials that were available at the local hardware store and came up with these plans. One of the many useful features of mycarpentry.com is the carpentry calculators section. They include the roof pitch calculator (for calculating roof pitch and slope), the cubic yard calculator (for estimating concrete), and the arch calculator (for calculating the elliptical curve of archways). The stair calculator is also a very useful calculator, and comes in two flavors (automatic and manual), for calculating the rise and run of stairs in a variety of design scenarios. Both Stair Calculators provide stringer diagrams with the results labeled on each section (Total Rise, Total Run, Step Height, etc.). The stinger diagrams automatically update, depending on which attachment method you choose (standard or flush). The small woodworking projects section contains free plans for building several small projects, ranging from birdhouses to picnic tables. These simple projects can easily be built in less than a day. Many of them can be built in less than an hour. Small Woodworking Projects - Small projects you could build in your back yard or on your home workbench. Free Picnic Table Plans - These picnic table plans are completely free outdoor furniture plans and a great addition to your wood outdoor furniture. Outdoor furniture plans - This section contains inexpensive patio furniture plans, wood outdoor furniture designs, and great deck ideas. Bar Plans - Build your own outdoor bar or indoor bar using these easy to build home bar plans. Use these plans to create your own bar design. 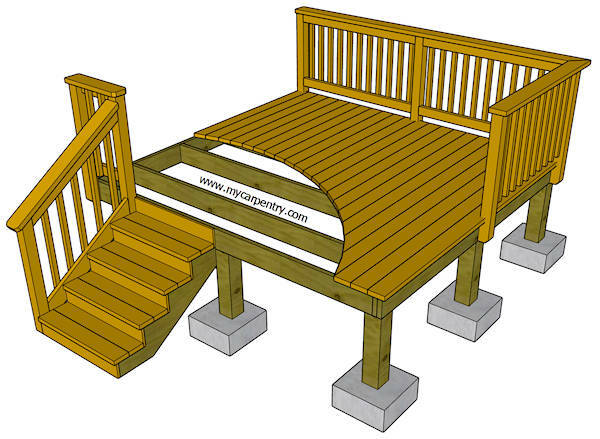 Bench Plans - Build your own custom wood bench using these free wooden bench plans, deck bench or picnic table bench. 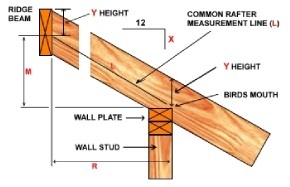 Build a birdhouse using these free bird house plans - Several great bird house plans that make use of old fence boards and other free materials. Easy craft ideas - Halloween Crafts, Fall Crafts, and Christmas Craft ideas. 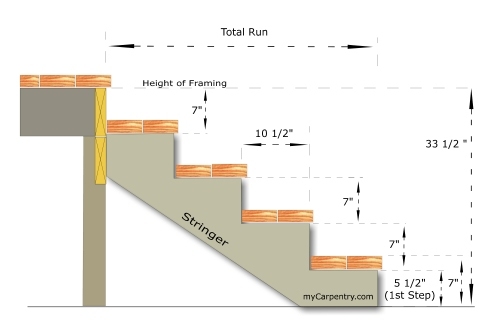 Framing Carpentry - Basic instruction on various framing techniques such as, framing a wall, framing a door, and roof framing. Stairs and Landings provides information about calculating stair rise and run, building stairs, building stairs with landings, and stair railing. How to build tutorials - build your own deck; framing a house; trim carpentry techniques; baseboard installation and simple crown molding. Green building - Learn what you can do to save money and conserve natural resources by building a patio cover and cistern installation. Essential Carpentry Tools. This page describes the essential list of tools that you will need for your carpentry projects. 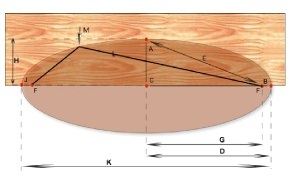 Carpentry math and formulas used for most carpentry projects. Measure Conversion Chart - These conversion charts convert various lengths, volumes, and weight values. These how-to books and carpentry books, available through the amazon book store, provide a variety of information about every aspect of carpentry. 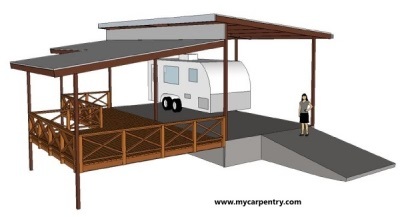 Build it yourself - This page contains a list of web sites that complement myCarpentry.com. myCarpentry Disclaimer - While the information contained within the site is periodically updated, no guarantee is given that the information provided in this website is correct, complete, and/or up-to-date. The Woodworking Projects Blog keeps you up-to-date with all additions and changes to the myCarpentry.com web site. You can use these free scroll saw patterns for unique gift ideas or homemade gift ideas. You can also create decorations for your home or business. The myCarpentry site search page provides a search tool and links to carpentry calculators, framing carpentry, small woodworking projects and more. The following list of carpentry terms are commonly used among carpenters, engineers and architects. Contact Us - Contact myCarpentry.com with any questions you may have about carpentry or general construction.